The B7 Echo Flight bag designed specifically for airline pilots and is perhaps the most useful flight bag every developed. 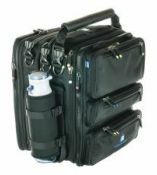 The B7 FLIGHT also works amazingly well as a daily personal bag and/or as a commercial carry-on bag. A 13" laptop plus a load of documentation plus an iPad, plus all the small stuff like cables, adapters batteries, and support stuff for all your technology, your digital camera, snacks, etc - all of this fits easily in this bag. Even your noise-reduction headset for those long flights.